How long do you normally have to wait before your supplier returns your requested quotation? 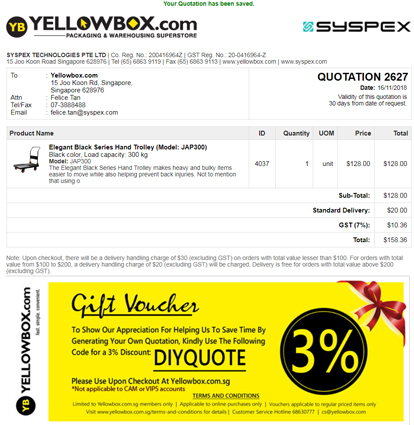 Yellowbox treasures your time hence we designed this superb function which allows you to generate your quotation instantaneously! Feel free to call our friendly sales advisers at (65) 6863 0777 for any required assistance! Your details will be used when our system creates your quotation. 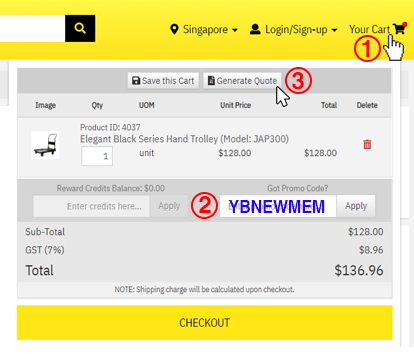 Find and add your required products to shopping cart. Upon approval, you may retrieve your quotation and proceed to checkout. Else, email or fax the endorsed quotation to us. Download or forward this guide to your friends. Key in Discount Code and click "Apply"
An email quotation will be sent; or, you may retrieve your quotation under "My Quotations".